Small toe clips for children - Solution posted! My son, aged 4 1/2 has recently started cycling with a club geared towards children from 4 to 16 years. Initially this involves learning bike control on the local cycling track (velodrome). I am trying to find some small toe clips and pedals to fit his bike. Does anyone know a source of toe clips that would fit younger children's feet? The current bike also has a one piece steel crank with 1/2" pedal threads, which are also harder to source than the more standard 9/16". 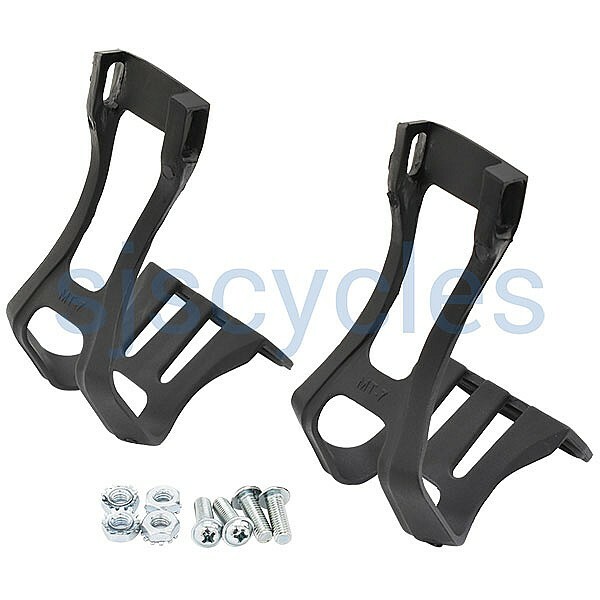 Has anyone ever made toe clips that can be adjusted for foot length? Re: Small toe clips for children - Solution posted! Judging by the number of views of this thread, there are quite a few of you out there interested in a solution to this. Necessity being the mother of invention, I decided to crack on and have a go at modifying the components that I could source. I solved the problem by buying some junior mtb pedals with plastic resin platforms, designed to take toeclips, and some christophe medium size plastic toe clips, which were the smallest I could find. My challenge was compounded by the fact that, as my son's bike is quite small (16" wheels), it has one peice steel cranks with 1/2" pedal threading, instead of the UK standard 9/16". In order to shorten the toe length of the clip, I have mounted the clip fixing to the back side of the leading end of the pedal. This required the bottom of the toe clip where the fixing holes are to be cut down across its width slightly in order to fit inside the pedal cage body. This is then packed it out to space it about a further 10mm back. The whit eplastic spacer is actually made from a peice of kitchen chopping board! This allows a fairly good position for my son, with ball of foot over pedal axle. In order to make the bottom of the toe clip sit down flush with the pedal platform, I cut a notch out of the front edge of the pedal. All this is held together with M6 screws and nylock nuts. As his feet grow, I can reduce the packing and extend the length of the toe clip, and then eventually if required, move it to the conventional position on the front edge of the pedal. This modification requires some bravery with a junior hacksaw, stanley knife and a file. I've posted some pictures that I hope illustrate this and may help others try something similar. Best viewed with the Slide Show option. I have added descriptions to each image. Which measure 40mm from the inside of the clip to the front of the pedal. The above solution can also be applied but without so much offset.